This Week In DOCTOR WHO History: Feb 19th to Feb 25th | Warped Factor - Words in the Key of Geek. The Third Doctor sings a Venusian lullaby this week in Doctor Who history. To get us started this week in Doctor Who history we have the third part of the First Doctor adventure The Massacre of St Bartholomew's Eve which was broadcast this day in 1966. Entitled Priest Of Death, like the other three parts to the story, it is missing presumed wiped so only the 5.9 million people tuning in were lucky enough to see it in its entirety. Moving on to 1972 and episode four of The Curse Of Peladon, which saw an audience of 8.4 million transfixed whilst the dandiest of Classic Doctor's hypnotises Aggedor with a Venusian lullaby, which goes something along the lines of "Kokleda partha mennin klatch, aroon aroon aroon, Ablarka sheena teerinatch, aroon araan aroon." Apparently this roughly translates to "Close your eyes, my darling - well, three of them at least." That smooth charmer! Finally, on this day in 1977 a huge 12.6 million scarf loving people tuned in to part four of The Robots Of Death. The Web Planet episode two (entitled The Zarbi) was broadcast on this day in 1965, and was watched by 12.5 million viewers. Two regenerations and 6 years later, the Third Doctor faced The Mind Of Evil, episode four drawing an audience of 7.4 million. Also on this day in 2008, viewers of the now online-only BBC Three could catch the latest episode of Torchwood at 10.01pm that Wednesday evening. Owen would soon be up and about for Dead Man Walking, which was watched by 1.01 million people. Now, we have a day with three part fours of their respective stories. First from 1970, Doctor Who And The Silurians, which was watched by 8.2 million viewers. 1976 saw The Seeds Of Doom draw an audience of 11.1 million, and finally in 1981 the Master got one hell of an extreme makeover when the the final part of The Keeper Of Traken was broadcast. 6.1 million viewers watched aghast! The first episode of Marco Polo was broadcast this day in 1964. 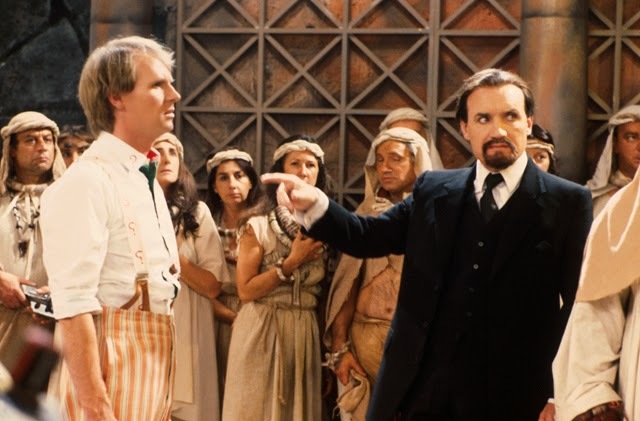 Entitled The Roof of the World, it is the earliest missing episode of Doctor Who, which means that only the 9.4 million people tuned into BBC1 at 5.15pm had the pleasure of viewing it in all its glory. A real shame as it is is also the show's first pure historical adventure. On this day in 1969, episode five of the Second Doctor adventure The Seeds Of Death had 7.6 million tuning in to watch. An impressive number but small change compared to the mighty 11 million sets of eyes watching the screen this day in 1975. It was the start of a new adventure for the Fourth Doctor, Sarah Jane and Harry, with part one of the two part The Sontaran Experiment kicking off at 5.30pm. Seven years later his much younger looking older self was three parts in to The Visitation. Season 19 saw Doctor Who move from its traditional Saturday tea time slot and instead was broadcast on Monday and Tuesday evenings across most of Great Britain. This particular Monday 9.9 million were tuned in. The following year the show had moved (again) to Tuesdays and Wednesdays, and Tuesday February 22nd saw part three of Terminus watched by 6.5 million viewers. Almost three years back now we ran a poll to find your favourite Dalek story (here). 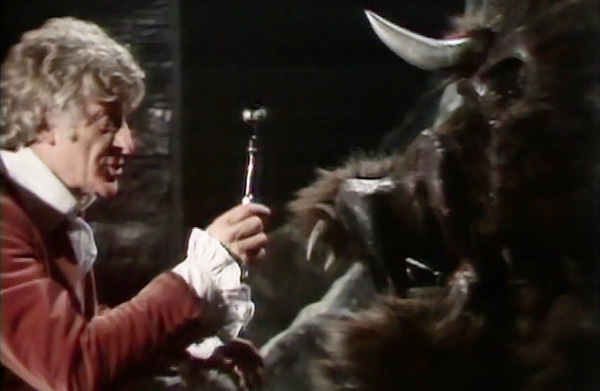 One which didn't receive much love was the Third Doctor adventure Death to the Daleks, coming 18th out of 21! Part one of that story was broadcast this day in 1974 - 8.1 million were tuned in, so where were they come the vote??? Tuesday February 23rd 1982 saw part four of the Fifth Doctor adventure The Visitation broadcast at 7:05pm, and watched by 10.1 million viewers. Part four of Terminus aired the following year and was watched by 7.4 million. And in his final year, the Fifth Doctor was beginning his penultimate adventure on this day. Part one of Planet of Fire drawing an audience of 7.4 million. 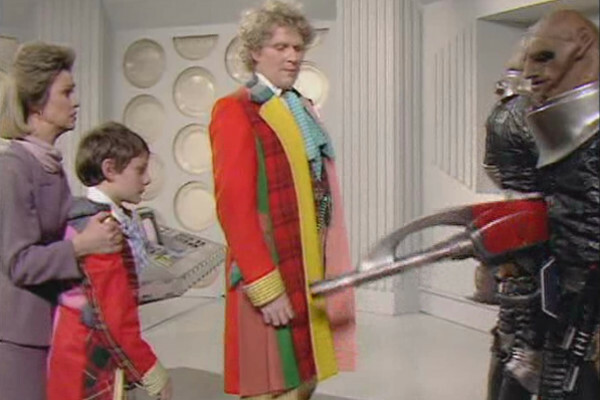 One regeneration later, the Sixth Doctor joined forces with his Second self for part two of The Two Doctors, which was watched by 6 million viewers. On the same day in 1985 the Doctor of the multi-coloured coat appeared in a special minisode (long before they were called minisodes). In a 9 minute-non-canon adventure, broadcast as part of Jim'll Fix It (a-hem), the Sixth Doctor, Tegan (?) 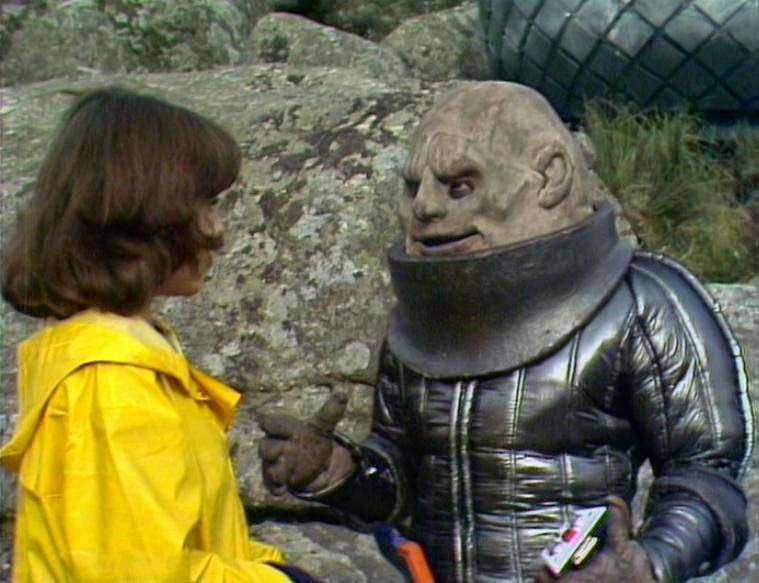 and a young boy named Gareth Jenkins found themselves in A Fix With Sontarans. On this day in 1968 8.4 million people were watching the Second Doctor in episode four of The Web of Fear. Part one of the 1973 Third Doctor adventure Frontier in Space was watched by 9 million viewers. Moving onto 1979 and the sixth and final part of The Armageddon Factor drew an audience of 9.6 million. 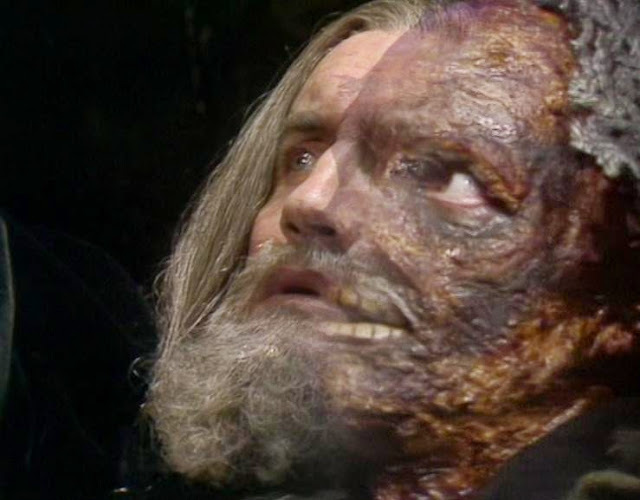 In 1984 part two of Planet of Fire was watched by 6.1 million, and during the wilderness years Radio 4 listeners were treated to the sixth part of the Third Doctor radio drama The Ghosts of N Space on this day in 1996. 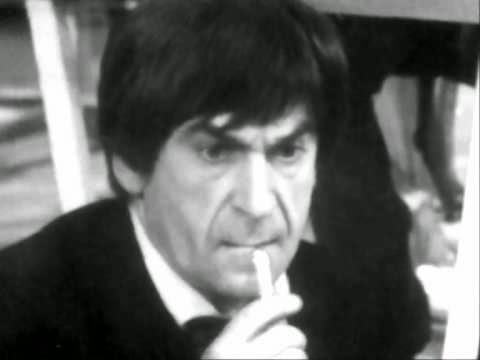 In 1967 episode three of the Second Doctor adventure The Moonbase drew an audience of 8.2 million viewers. And finally for this week in Doctor Who history, on this day in 1978 part four of The Invasion Of Time was watched by 10.9 million people.